Two friends and I had a spam musubi making night (50 spam musubis! ), and we went out for dinner while the rice was cooking. 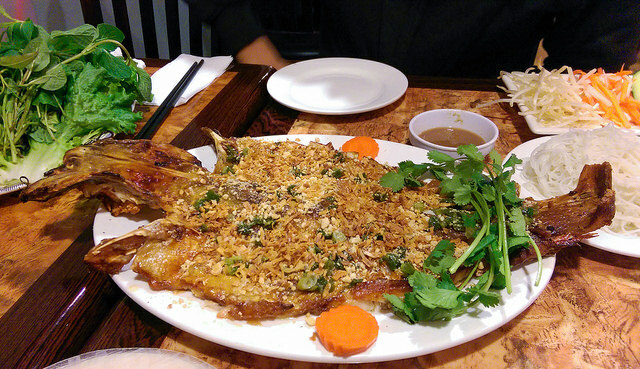 Huong Que had a grilled catfish dish for two, three, or four ($29, $33, or $38 USD, respectively). We got the catfish for two, which was just the right amount for the three of us. If all three of us were big eaters, then we would probably have ordered the catfish for three. The Vietnamese name of this dish, cá nướng cuộn bánh tráng, translates to “grilled fish rice paper roll”. The grilled whole catfish was covered in chopped peanuts and onion, and served with rice paper, vermicelli, leaves, bean sprouts, cucumber, pickled carrot, and pickled daikon. The fish sauce had a subtle hint of shrimp flavor in it. When I told my mom about this dish, she immediately reminiscenced how she ate steamed (not grilled) catfish with rice paper and similar ingredients, with her family and relatives in Saigon. Cá Nướng is a really common Vietnamese dish of roasted fish. And although it’s most often made with catfish because of its firm and somewhat fatty flesh, you can use any fish that can hold up to high heat while still staying moist. When given the choice, I recommend roasting a whole fish. Not only does it help retain moisture but you’ll almost always get a better flavor when you cook your proteins bone-in. A lot of folks will use a variety of aromatics and spices to marinate it. But since you’ll typically dunk the roasted fish into a nước chấm (dipping sauce), you can stick with a minimal preparation before cooking the fish as the sauce will provide the extra flavor punch. Cá Nướng can be served over rice, with vermicelli noodles, inside a bánh mì (sandwich) or how we typically like it –cuốn bánh tráng (wrapped in rice paper). Yummy in the tummy! I would definitely recommend this to family and friends! that does look yummy!! i also know about the one your mother remembers back in Saigon. I also have had the steamed catfish, then you wet a rice “tortilla”, add veggies and roll it up and dip into a sauce. i am drooling just thinking about that! !